How do you keep the deer from decimating the plants? By providing deterrents and by growing things the deer don't like to eat. 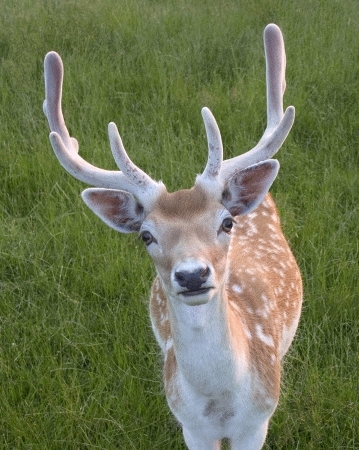 Deer have a range of vision in the order of 310 degrees, and see very well even at night. They can spot our tasty gardens from a long way away, which can make a solid fence a good defence against their entering our gardens. In general, deer seek out what is available at the time of year. This applies particularly in spring, when succulent garden plants such as crocus, tulips, and newly-planted pansies are available. New growth of shrubs is always a preference, particularly fruit trees, and even evergreens, most notably yews, cedars and white pine, which offer high protein, water and carbohydrate content. Some plants are very attractive to deer, for example Hostas. Young maples seem to be a favourite tree for bucks to scrape their antlers on to remove the velvet as fall approaches. This removes the bark and is guaranteed to kill the tree the first year. I recommend usinng tree guards, inexpensive and found at most garden centres, or you can improvise with a short section of chain link or snow fencing wrapped loosely around the trunk. Highly fragrant plants effectively deter deer, especially when planted in combinations. This is confusing to the deer, and makes them uneasy as the odours make them less able to detect predators. Some sure-fire highly fragrant herbs include mint, catnip, chives or any other allium (including garlic), sage, rosemary and thyme. Fragrant spring bulbs include hyacinths, daffodils or any other narcissi, fritillaria, squill and chionodoxa. Deer also tend to avoid plants with a coarse or fuzzy texture, as well as those with a spiny texture or thorns. What are deterrents for deer? High fencing is one of the most effective ways of preventing deer from invading our gardens. To protect a small portion of your property, including a veggie garden alone, there are other options. For instance, a simple barrier made of several strings of heavy fishing line strung horizontally covering a height of 2-4 feet, can startle deer as they run into it. A number of zone 4 hardy plants are guaranteed to not be eaten by deer. Shrubs include most spireas, including false spirea (Sorbaria,) any of the Barberries, Cutleaf Stephanandra, lo-grow Sumac, Fragrant Sumac, Cotoneaster, Golden Ninebark, Willows including the Japanese willows, Potentilla, spruces, the Mugho pine, and Hypericum (St. John's Wort). This partial list provides a decent variety of colours, textures and sizes you can use to enhance any garden, combined with resistant perennials. The best perennials I have found to be ignored by deer are Anise Hyssop, almost any herbs as mentioned earlier, Asters, Echinacea, Bergamot, Lungwort, Liatris, and any ornamental grasses. So if you want to keep a thriving garden in cottage country, follow my tips. Happy gardening!